So, you bricked your shiny new PSP? The good news is that now you don't have to send it in for repair. Thanks to some hard work from the guys over at N00bz!, it has been discovered that all you need to unbrick your PSP is a special battery and a specially formatted memory stick. At the moment this only works with the 1000 or early 2000 series PSPs, so if you just bricked your 3000 series you're out of luck. First you need a special battery called a Pandora's Battery. It's just a normal battery with the internal serial number set to all 1s. You can obtain a Pandora's battery one of three ways. The first way is to make one if you have a compatible battery and access to another PSP capable of running homebrew software. Not all batteries are convertible but most Datel and older Sony battery's should work fine. Load either the open source Pandora for new firmwares or the original for 1.50 firmwares and put in the battery you want to convert. Be sure to backup your EEPROM if you want to restore the battery back to normal after you unbrick it then flash it according to the instructions. The second way is to physically modify your battery using the instructions found here or here. I tried this technique on an original Sony PSP battery (like the one shown in the first post) but it didn't work so I don't put much trust in this method. The third and simplest method is to just buy one. 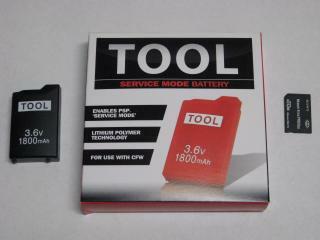 They are often called Tool batteries and this is the method I went for. I got mine from Code Junkies and it works great. It's only $25 but took about a month for delivery. Next you need a freshly formatted Memory Stick Pro Duo of at least 256MB. You can also do this one of two ways. If you have access to another homebrew enabled PSP you can stick in your fresh memory stick and load it with the latest Despertar del Cementerio. Follow the instructions found in the Readme (you can find old firmwares here). If you don't have access to a homebrew enabled PSP then you can use a USB Memory Stick Pro Duo card reader on your PC. You can check out the AutoInstaller in this thread or Google for TOTALNewbieasyInstaller. They should have everything you need to make the proper memory stick. Now insert your created magic memory stick into the bricked PSP and drop in your Pandora's Battery. Then follow any instructions given on the screen. It took me a couple tries to get it right the first time. If your Pandora Battery is working correctly your PSP should automatically turn on as soon as you insert the battery. If your PSP does not turn on, then you do not have a working Pandora battery. If you have a working battery and your memory stick is created correctly then both the memory stick and wifi light will turn on when you drop in the battery. If they do not light up, then your memory stick is not made correctly. If you have a PSP that you've bricked I'm offering my services free of charge to help you unbrick it. You mail me your PSP or battery and pay shipping both ways and I'll get you up and running again. A little extra for a beer to drink while I work my magic is also accepted ;-).